The Finisher understands perfectly what is going on here, it seems, and now he is pondering his options with his remaining henchmen. Him quietly standing there at least seems to imply that no one has hired him for this upcoming battle, so that’s something. Oh, no, no no no. Please, don’t be so irresponsible as to fire a gun INTO THE AIR. It’s just basic physics, what goes up must come down. Which means you’ve just shot a bullet with no control over where it’s going, and no consideration for what (or who!) it hits once it gets there. 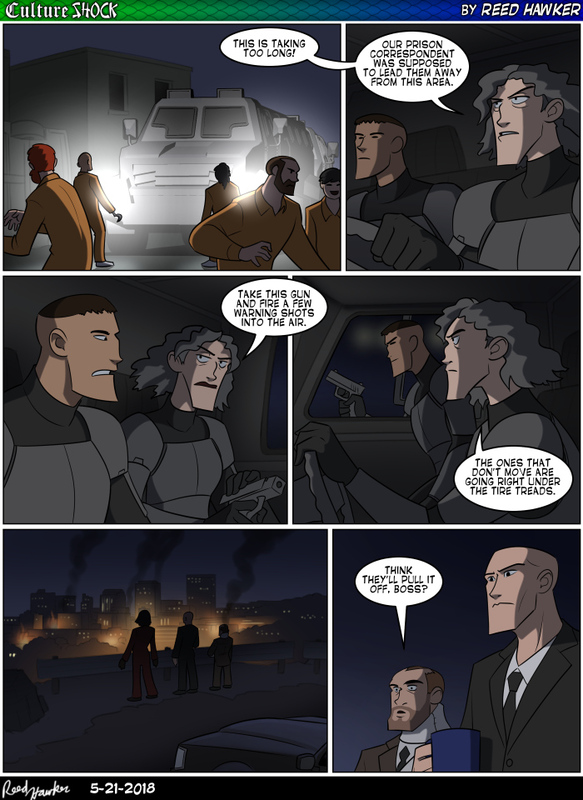 One, these are the bad guys, and she just openly declared she’s willing to run over people. I don’t think she cares about some errant bullets. Two, statistically the bullets are most likely to not harm anyone. They would probably hit the side of some building, too high up for anyone to see, considering how many sky scrapers they have around there. He could also try his luck shooting some trashcans. That’s a relative soft target, so no ricochets but hard enough to slow a bullet down so a stray hit has to be really lucky to hit something and deal serious damage. One in a million that you score a lethal blow. I guess it’s about the same chance to give somebody a heart attack with the sound of the shot alone. I am confused how the unnamed goon in the passenger seat is high enough in the organization to ride with the boss, but not to carry his own gun while on a mission. Not to mention he is not the one driving, because if the boss is driving he is not giving his full attention to controlling the rest of the formation. Getting special attention from the boss is not a privilege of rank. Not getting a gun or the wheel is not a sign of kindness. Getting a gun in the middle of a situation is either a desperate measure or a test of loyalty. @Marscaleb This is a comic. Of course the bullet is going to hit something important. @west If you say so, despite that chin. I figure if I can’t tell (and the artist has well demonstrated that he/she can draw women who look like women, in many shapes and sizes) then the gender specification for that character is not important.